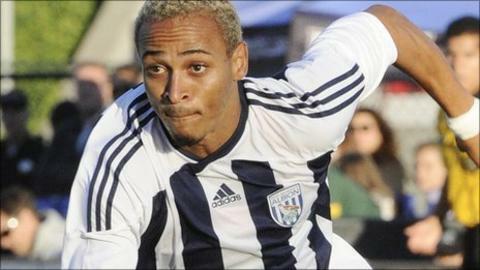 Striker Peter Odemwingie has ended speculation over his future by signing a new three-year deal with West Brom. The 30-year-old was the Baggies' top scorer with 15 league goals in his first season in the English top-flight, sparking interest from rival clubs. Albion boss Roy Hodgson confirmed on Thursday that the club had rejected a £4m bid from Wigan last weekend. "I'm glad everything is sorted out. It was only a few details that delayed everything," Odemwingie told BBC Sport. "There is a huge challenge for us to be better than last season's performance. Personally, and as a team, we must prove that last season was not a fluke. "I have always said I like it here, and now I need to concentrate on regaining my full fitness and give my all to the club like I always do." The Nigerian international joined West Brom last summer on a two-year contract from Lokomotiv Moscow for £2.5m and was an instant success, finishing the Premier League's fifth highest scorer as the club avoided relegation. Delays in contract negotiations, which began in May, led to interest from rival clubs, but Hodgson said he was always confident Odemwingie would stay. "I'm obviously very pleased that Peter has pledged his future to West Bromwich Albion," said Hodgson. "I always believed this would be the case and I am grateful to both him and the club for reaching an agreement. "I do not think we have concerned ourselves with any bids that have come in for him so far. Odemwingie missed last Sunday's season opener against Manchester United because of an ankle injury and is a doubt for Saturday's trip to Chelsea. He added: "Started running. Optimistic me [sic] says I'll be ok for Saturday with magic from the doctor though." West Brom coach Michael Appleton was more cautious about Odemwingie's chances of being involved at Stamford Bridge. He told the club website: "Peter has a 50/50 chance of training at the end of the week. "Whether we involve him straight away in the game is a decision the gaffer and staff will make nearer the time. "We still have three days before the game so if he plays any part on Saturday it will be a bonus."